-- Friday, Saturday and Public Holidays during Golden Week. -- Fridays and Saturdays from Friday 14 June through Saturday 28 September. -- Last Friday (Premium Fridays) of every month. For details, please see the General Information section of this website. Admission to the Permanent Collection Galleries is free on Sunday 24 February 2019, in celebration of the 30th anniversary of the emperor's enthronement. The gallery explanatory panels at the "Le Corbusier and the Age of Purism" are written only in Japanese. Please use this QR code to download the exhibition's special app. This will allow you to read the English, Chinese and Korean versions of the every gallery explanatory panel at the Exhibition Space on your mobile device. By Searching your app store. Please enter "The National Museum of Western Art"
＊This app corresponds to the artwork's number displayed in the Exhibition Space. The gallery explanatory panels at the "Rubens and the Birth of the Baroque" are written only in Japanese. Please use this QR code to download the exhibition's special app. This will allow you to read the English, Chinese and Korean versions of the every gallery explanatory panel at the Exhibition Space on your mobile device. Due to the maintenance of our museum, the entire wings are closed during the following period of time: Monday 21 January through Monday 18 February 2019. Please forgive us any inconvenience caused by this closure. Your understanding is greatly appreciated. On Japan's national holiday celebrating culture, 3 November, we welcome many visitors every year, and we anticipate many visitors this year as well. Thus, in order to maintain a favorable viewing environment and ensure the safety of displayed art works, all still and video photography will be forbidden in the permanent Collection Galleries on Saturday 3 November 2018. As per previous regulations, photography is not permitted in the Special Exhibition Galleries and the "Views of Rome - Transition in Images and Media" in the Prints and Drawings Gallery. We greatly appreciate your cooperation with these restrictions. We are delighted to announce that beginning on Wednesday, October 10, 2018, the NMWA will present the following work for the first time in our Permanent Collection Galleries (Main Building, 2nd Floor). 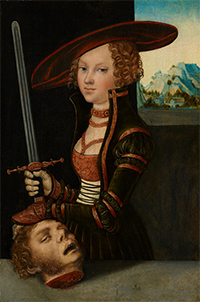 ・ Lucas Cranach the Elder, Judith with the Head of Holofernes, c. 1530, oil on panel, 37.2 x 25 cm, purchased in 2018 (P. 2018-0001). -- Fridays and Saturdays from Friday June 22 throgh Saturday September 29. 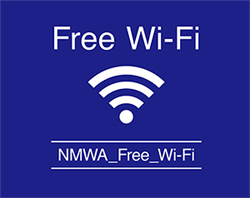 Free Wi-Fi is available in the National Museum of Western Art. In order to use this connection, registration of information such as email address is required. *Communication in this network is not encrypted. Please be aware that third parties may have access to your information. *This free Wi-Fi service is compatible with the smartphone application Japan Connected-free Wi-Fi. Due to the maintenance of our museum, the entire wings are closed during the following period of time: Monday 29 January through Friday 23 February 2018. Please forgive us any inconvenience caused by this closure. Your understanding is greatly appreciated. We are delighted to announce that beginning on Saturday, September 30, 2017, the NMWA will present the following works for the first time in our Permanent Collection Galleries (New Wing, 1st and 2nd Floors). 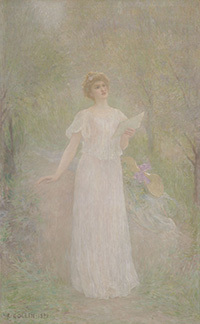 The following two works will also be exhibited in our Permanent Collection Galleries (New Wing, 2nd Floor). The entire museum will be closed on Tuesday 26 September for the re-installation of art works. The Permanent Collection Galleries in the New Wing will additionally be closed from Wednesday 27 September to Friday 29 September 2017. The Main Building galleries will be open throughout this closure period. The entire museum will be closed for exhibition preparation on Friday 20 October 2017. We apologize for any inconvenience caused by these plans and express our appreciation for your understanding. We are delighted to announce that beginning on Friday, June 9, 2017, the NMWA will present the following work for the first time in our Permanent Collection Galleries (New Wing, 2nd Floor). Since the museum’s inclusion on the World Heritage List in July 2016, we have welcomed many more visitors, and to improve viewing and alleviate overcrowding, the evening opening of the Collection Galleries has been extended to include both Friday and Saturday. In addition, for this year’s Golden Week holidays, April 28 (Fri) to 30 (Sun) and May 3 (Wed, national holiday) to 7 (Sun), and on Fridays and Saturdays in July, August and September, the opening hours of the Collection Galleries are extended to 21:00. Moreover, in addition to the free admission to the Collection Galleries on the second and fourth Saturdays every month, we will also continue the free admission to the Collection Galleries during evening opening hours (17:00 - 20:00) on Saturdays, which was introduced in September last year to celebrate our inclusion on the World Heritage List. We are also pleased to announce that as an aid to further deepen the understanding of Western art, our curators post images and commentaries about our collections on Google Art & Culture. To see this website, please click here. To help us offer our visitors these better services, we will change the admission fees for the Collection Galleries as described above, and we would be grateful for your understanding. The National Museum of Western Art, Tokyo is committed to improving our displays and services, and we very much hope you will be able to enjoy our extended opening times and look forward to you visiting us. * The days of the week for the extended gallery opening hours vary depending on the Special Exhibition. * The opening hours of the museum shop and other facilities (excluding Café Suiren) are the same as the gallery opening hours. The following sections of the Permanent Collection Galleries (New Wing) will be closed for re-installation of art works. New Wing 2nd Floor will be closed. The entire New Wing will be closed. -- The entire NMWA is closed on Mondays. -- The Main Building galleries will be open throughout this closure period. Starting in September 2016, the NMWA Permanent Collection Galleries will be open until 20:00 (entrance closes at 19:30) on both Friday and Saturday evenings. Previously Friday has been the only extended hours day every week. In commemoration of the Main Building being added to the Register of World Heritage Sites, Permanent Collection Galleries entrance will be free of charge from 17:00 – 20:00 on Saturday evenings from September 2016 through March 2017. We look forward to welcoming you to the museum during these extended hours. ＊Please be aware that the Special Exhibition Galleries will close at 17:30, as usual, on Saturdays during this period. Entrance closes at 17:00. On July 17, 2016, UNESCO designated 17 works by the French architect Le Corbusier, including the NMWA Main Building, as World Heritage sites under the designation “The Architectural Work of Le Corbusier, an Outstanding Contribution to the Modern Movement”. This announcement has meant a greatly increased number of visitors to the NMWA and we can anticipate that even more will visit the museum in the months to come. Thus in order to maintain a favorable viewing environment and ensure the safety of displayed art works, all still and video photography will be forbidden in the Permanent Collection Galleries on Free Admission Days, specifically the 2nd and 4th Saturdays of every month, Saturday 20 August, 2016 and Japan’s national holiday celebrating culture, Thursday 3 November, 2016. Photography is also forbidden in all Special Exhibition galleries, and the “Le Corbusier and the Museum of Unlimited Growth” in the Prints and Drawings Gallery. On July 17, 2016, UNESCO designated 17 works by the French architect Le Corbusier, including the NMWA Main Building, as World Heritage sites. To commemorate this designation, all Permanent Collection Galleries will be open free of charge on August 20 (Sat.). Given the recent increase in visitors to the NMWA, the museum will also hold extended opening hours on Fridays in August, with the galleries open until 20:30 and entrance closing at 20:00. We hope that everyone will enjoy these opportunities to visit the World Heritage-designated Main Building and see the NMWA's many masterpieces. Given the Ise-Shima Summit of world leaders being held on Thursday26 May – Friday 27 May 2016, the Metropolitan Police Department has issued guidelines for all public facilities to strengthen anti-terrorist security measures. In response, the NMWA, its staff members and affiliates have increased their vigilance and are working to ensure the safety and enjoyment of all visitors to the NMWA. We ask for your assistance and cooperation with these efforts. As a heightened security measure during the Ise-Shima Summit event, all items brought to the NMWA by visitors will be subject to inspection for the three days between Wednesday 25 May and Friday 27 May 2016. Visitors will not be allowed to bring large items or liquids (such as water bottles, PET bottles, etc.) into the NMWA. Large items must be checked at the special Cloakroom set up in the NMWA Forecourt. Liquids must either be consumed or discarded prior to entry. We can anticipate some crowding due to this added procedure and it might take longer than usual to enter the NMWA. We appreciate your understanding and cooperation with these special circumstances and procedures. As the final weeks of the NMWA’s current Caravaggio exhibition approach, we anticipate even larger audiences, and as a result, crowding not only in the Special Exhibition Wing but also in the Permanent Collection Galleries. Hence, effective immediately, photography is forbidden in the Permanent Collection Galleries, in order to both enhance the viewing atmosphere and ensure the safety of the displayed art works. We appreciate your understanding and cooperation. As per previous regulations, photography is not permitted in the Special Exhibition Galleries. We are delighted to announce that beginning on March 19, 2016 the NMWA will present the following works for the first time in our Permanent Collection Galleries (Main Building, 2nd Floor). The NMWA’s 2015 purchase acquisitions also included The Capture of Christ by Bartolomeo Manfredi (c. 1613-15, Oil on canvas, 120 x 174 cm, P.2015-0001). This painting is already on view in the Special Exhibition galleries in the exhibition Caravaggio and His Time: Friends, Rivals and Enemies (through June 12). The National Museum of Western Art will be open on Monday 28 March, Monday 2 May and Monday 18 July 2016. The entire museum will be closed on Monday 8 July 2016 for exhibition preparation. Please forgive us any inconvenience caused by this closure. Your understanding is greatly appreciated. The National Museum of Western Art, Tokyo (NMWA) is pleased to announce the launch of an online Publications Repository, which offers free online access to scholarly publications of the NMWA. 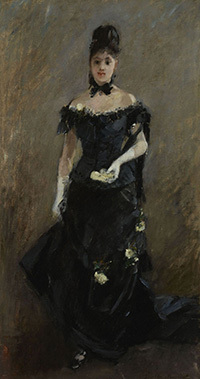 Powered by a SaaS type IR cloud service "JAIRO Cloud", developed by the National Institute of Informatics (Tokyo), this online database provides a new platform for the storage and dissemination of scholarly work of the National Museum of Western Art, Tokyo community. Due to the maintenance of our museum, the entire wings are closed during the following period of time: Tuesday 12 January through Monday 29 February 2016. The Permanent Collection Galleries in the Main Building and New Wing will be closed for facilities maintenance from Tuesday 1 March to Friday 18 March 2016. Visitors to the Caravaggio exhibition during this period will each be given one ticket for free admission (limited time access) to the Permanent Collection Galleries. We apologize for any inconvenience caused by these plans and express our appreciation for your understanding. We are delighted to announce that beginning on April 27, 2015 the NMWA will present the following work for the first time in our Permanent Collection Galleries (Main Building, 2nd Floor). Andrea Del Sarto, The Madonna and Child, c. 1516, Oil on panel, 89x66.6cm, Purchased in 2014, P.2014-0001. The National Museum of Western Art will be open on Monday 30 March. We are delighted to announce that beginning on March 17, 2015 the NMWA will present the following works for the first time in our Permanent Collection Galleries (Main Building, 2nd Floor). Attributed to Johannes Vermeer, Saint Praxedis, 1655, Oil on canvas, 101.6 x 82.6cm, On deposit, DEP. 2014-0001. 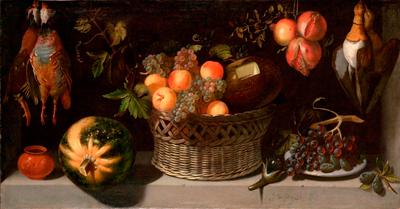 Juan van der Hamen y León, Still Life with a Basket of Fruit and Game Fowl, c. 1621, Oil on canvas, 75.4 x 144.5 cm, Purchased in 2014, P. 2014-0002. 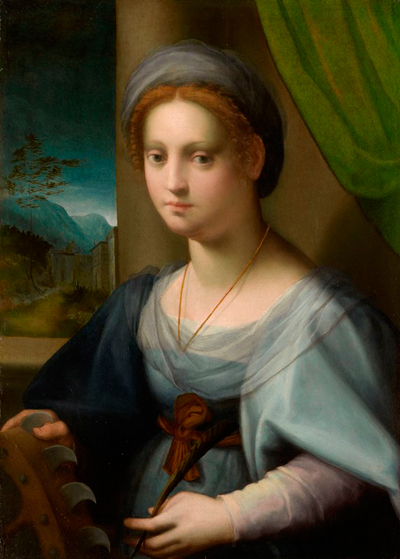 Domenico Puligo, Portrait of a Lady as Saint Catherine of Alexandria, 1520s, Oil on panel, 76.8 x 55.2 cm, Donated in 2014, P. 2014-0003. 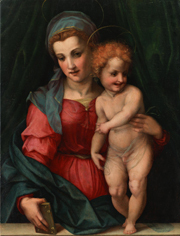 The NMWA’s 2014 purchase acquisitions also included Madonna and Child by Andrea del Sarto (c. 1516, Oil on panel, 89 x 66.6 cm, P2014-0001). We are currently preparing a new frame suited to this important painting. We will make a separate announcement of its first public display in the near future. Due to the maintenance of our museum, the entire wings are closed during the following period of time: Tuesday 13 January through Monday 2 March 2015. The Permanent Collection Galleries in the Main Building and New Wing will be closed for facilities maintenance from Tuesday 3 March to Monday 16 March 2015. Visitors to the Guercino exhibition during this period will each be given one ticket for free admission (limited time access) to the Permanent Collection Galleries. We apologize for any inconvenience caused by these plans and express our appreciation for your understanding. The National Museum of Western Art will be open on Monday 31 March. Due to the maintenance of our museum, the entire wings are closed during the following period of time: Monday 10 March 2014 through Monday 24 March 2014. Please forgive us any inconvenience caused by this closure. Your understanding is greatly appreciated. In line with the increase in consumption tax on Tuesday 1 April 2014, Permanent Collection admission ticket prices will increase. Plese see here for further details. The entire museum will be closed on Friday 6 December for exhibition preparation. Please forgive us any inconvenience caused by this closure. Your understanding is greatly appreciated. The entire museum will be closed on Thursday 5 September for exhibition preparation. Please forgive us any inconvenience caused by this closure. Your understanding is greatly appreciated. The entire museum will be closed from Monday 24 June 2013 through Monday 8 July for the　building inspections. Please forgive us any inconvenience caused by this closure. Your understanding is greatly appreciated. The entire museum will be closed on Friday 1 March 2013 for exhibition preparation. Please forgive us any inconvenience caused by this closure. Your understanding is greatly appreciated. The entire museum will be closed from Monday 4 February 2013 through Monday 11 February for the　building inspections. Please forgive us any inconvenience caused by this closure. Your understanding is greatly appreciated. The entire museum will be closed from Monday 29 October 2012 through Friday 2 November for the　building inspections. Please forgive us any inconvenience caused by this closure. Your understanding is greatly appreciated. 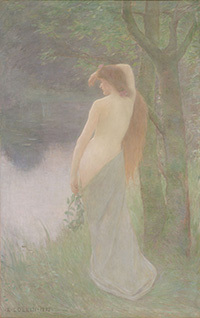 The entire museum will be closed on Tuesday 12 June 2012 for exhibition preparation. Please forgive us any inconvenience caused by this closure. Your understanding is greatly appreciated. Since 2010, the NMWA has made its Touch the Museum app available for free at the iTunes App Store for use on iPhone and iPod Touch devices. This application is a viewing guide to the NMWA Permanent Collection galleries, and contains a wealth of content, including images of works from other museum collections, video footage from the NHK Archives, and on-site explanations of art works by the NMWA director and curators, and architectural historians. Now, this same app is available for free download from the Google Play Store for use on Android devices. (click here for details). This means that Touch the Museum is available to smart phone users on iPhone, iPod Touch and Android devices. We hope that visitors will enjoy this new way to become more familiar with NMWA collection art works. Please forgive us any inconvenience caused by this closure. Your understanding is greatly appreciated. The entire museum will be closed on Friday 25 June 2010 for exhibition preparation and building inspections. “ Napoli,la Bellezza e la Corte – Capolavori del Museo di Capodimonte, dal Rinascimento al Barocco” will be held from June 26 through September 26. The advanced tickets are available (started selling at the Museum's Information Desk). Regarding the Brian Clark Lecture scheduled for 23 February (Tues.) in conjunction with Exhibition of Frank Brangwyn, unfortunately Mr. Clark's plans have changed and he will not be traveling to Japan at this time. We greatly regret any inconvenience caused by this cancellation. The lecture scheduled for 23 February (Tues.) Libby Horner will begin at 13:00. The lecture is scheduled to end at 14:30. For further information about "Lectures/Symposium", please click here. The entire museum will be closed to the public for the following periods due to investigations related to the NMWA’s nomination for UNESCO World Heritage status. The Permanent Collection Galleries located in the Main Building will be closed during the following period due to investigations related to the NMWA’s nomination for UNESCO World Heritage status. The Permanent Collection Galleries located in the New Wing will be open during this period. Please forgive any inconvenience caused by this closure. Your understanding is greatly appreciated. Notice: Admission will be free of charge from January 9 through February 14, 2010, both in appreciation of the public support of the activities involved in the registration of the NMWA Main Building on the UNESCO World Heritage list and in commemoration of the museum’s 50th Anniversary. “Exhibition of Frank Brangwyn” will be held from February 23 through May 30. The advanced tickets are available (started selling at the Museum’s Information Desk). The entire museum will be closed to the public for the following periods due to UNESCO World Heritage-related investigations. Permanent Collection Galleries in the Main Building will be closed during the following time period due to UNESCO World Heritage-related investigations. Permanent Collection Galleries in the New Wing will be open during this period. Plese see here for further details. Your understanding of this matter would be appreciated. “L’eredità dell’Impero romano”exhibition will be held from September 19 through December13. The advanced tickets are available (started selling at the Museum’s Information Desk). The Saturday 13 June lecture by Kazuyo Sejima, related to the exibition "Le Corbusier and the National Museum of Western Art," has been canceled due to the lecturer's circumstances." The museum will be open throughout the above period. TOUCH THE MUSEUM is an audio and visual guide using iPod Touch devices to enjoy the permanent collection of the National Museum of Western Art. Prior to the official start of TOUCH THE MUSEUM in the next fiscal year. the museum will run the program for a limited period of six days from 10 February 2009 through 15 February 2009. The entire museum will be closed on February 27, 2009 (Friday) for exhibition preparation and building inspections. We will provide New Year gifts for some of the first to arrive. Please come and enjoy our exhibitions. A TV program focusing on the museum’s core collection, the Matsukata Collection, and the collector Kojiro Matsukata will be featured. 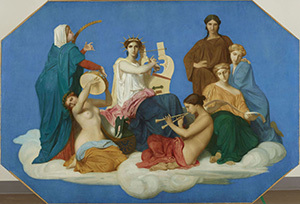 “LES REVOLUTIONS DE L’AGE CLASSIQUE : LA PEINTURE EUROPEENNE DU XVIIeme SIECLE DANS LES COLLECTIONS DU MUSEE DU LOUVRE”exhibition will be held from February28 through June14. The advanced tickets are available (started selling at the Museum’s Information Desk on Wednesday, December3). New Wing closed from September 2007 through May 10 (Sun.) 2009. All Permanent Collection Galleries closed from May 11 (Mon.) through June 3 (Weds) 2009. NMWA have launched an online catalogue of the collection on the web site. The database covers the paintings, drawings, prints, sculpture, decorative arts and books in the collection, including some "on deposit" items. Works of art can be searched by keyword, artist name, object title and collection number. Displayed works can also be traced from their position in the gallery as noted on the Permanent Collection map of the galleries. <bijutsukann.com> Web site is featuring a new regular column, "MOTTO SIRITAI! The Museum of Western Art." (The site is all in Japanese.). Click here to go to the site. The entire museum will be closed on June 13, 2008 (Friday) for exhibition preparation and building inspections. EPSON, the official partner of the National Museum of Western Art inaugurated OPEN museum site in EPSON site. 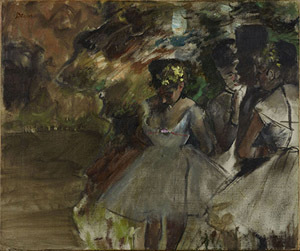 "Corot souvenirs et variations" exhibition will be held from June 14 through August 31. The advanced tickets are available (started selling on Monday, March 10). In addition, valuable pair tickets are also available. The Japanese government announced on Monday, January 7, 2008, its decision to nominate the main building of the National Museum of Western Art for inscription on the UNESCO World Heritage List. The nomination for the building, designed by French architect Le Corbusier, is part of a nomination made by the governments of France and other countries for a number of Le Corbusier's architectural assets. Japan's nomination is based on the Convention Concerning the Protection of the World Cultural and Natural Heritage. The UNESCO World Heritage Committee will decide whether to inscribe the museum building on the World Heritage List through its sessions and investigations after it receives the nomination. French government is the main force behind the nomination of "Le Corbusier's architecture and urban planning." All of the nominated works, which are located throughout the world, would be registered as a single entry. Le Corbusier (1887-1965) is known as a master of modern architecture. The French government plans to submit its nominating form of seven participating countries to the UNESCO World Heritage Centre by February 1, 2008. The International Council on Monuments and Sites (ICOMOS) will conduct a field survey during summer and autumn 2008. The UNESCO World Heritage Committee will decide whether to inscribe the museum building on the World Heritage List at its 33rd session to be held around July 2009. For further details, please click here. (PDF file about160KB)(Japanese only). The French Government and The Foundation Le Corbusier are working together to register architectural works by Le Corbusier as a UNESCO World Heritage site. We are very happy that the main building of the National Museum of Western Art has been included in the tentative World Heritage list. There will still be difficult times ahead until an official nomination is issue, followed by the World Heritage registration. We appreciate the efforts of all people who continue to love and support the museum. We will continue to work hard to make the museum available not just to the public in Japan but also to people throughout the world. For further details on the Main Building, please click here. The permanent collection galleries are partially closed through March 2009 (scheduled) due to renovation work for the new wing. The main building will remain open. The National Museum of Western Art (Director: Masanori Aoyagi) has decided to implement "OPEN museum" project. The museum received a three-year sponsorship from Seiko Epson Corporation (President: Seiji Hanaoka) and Epson Sales Japan Corporation (President: Seiichi Hirano). Saturday Arts (Doyo Bijutsu) is an experimental program in which participants can enjoy appreciating paintings and sculptures of the museum. Advanced booking is required. For further information, please check here. Viewing hours are 1 p.m.-5:30 p.m. on the second and fourth Friday of every month. Viewing is free of charge but only by advance reservation. Those who would like to use the facility, please make reservations one day in advance via e-mail or by phone at 03-3828-5131. Your personal ID will be required to enter the room.